Earlier this year, country music legend Tim McGraw shared with fans that he will be embarking on a nationwide tour and more recently, he shared the specifics of the tour that fans have been waiting for. The Shotgun Rider tour will kick off this June in Little Rock, Arkansas with shows pinned all over the past from east to west, north to south, McGraw will wind around the country before ending the tour in Irvine, California in mid-September. With him on the road this summer will be “Take It On Back” singer Chase Bryant and Billy Currington. The tour will make stops in 33 cities. McGraw released his latest album, Sundown Heaven Town in 2014, making it McGraw’s thirteenth studio album which was released on Big Machine Records. Sundown Heaven Town debuted at No. 1 on the Billboard Country Albums Chart and at No. 3 on the Billboard 200 having sold more than 71,000 copies. McGraw’s upcoming tour is titled off of the album’s third single, “Shotgun Rider” which has received rave reviews from critics while performing well on country radio. “Shotgun Rider” was also certified gold by the RIAA as of January having sold more than 550,000 copies. 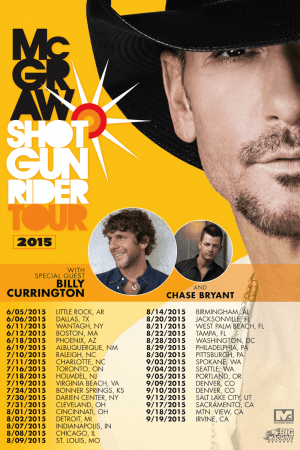 For tour dates and ticket information regarding McGraw’s Shotgun Rider tour this summer featuring Chase Bryant and Billy Currington click here.